The Toronto Blue Jays headed into extra innings for the third time this season, as they would look to sweep the San Francisco Giants at AT&T Wednesday afternoon. Marcus Stroman would be sent to the hill in search of his fifth win of the season. The Giants would send Madison Bumgarner as he was in search of his fifth win as well. In the bottom of the second, the Giants would get on the board first as Gregor Blanco doubled to right, scoring Brandon Crawford. Conor Gillaspie would also see the plate, as he would reach home safely on a groundout by Denard Span. Once Josh Donaldson reached base, he would find his opportunity and steal third. Donaldson reached home helping his team get on the board scoring on a groundout after Crawford would throw out Edwin Encarnacion at first. That wouldn’t be enough however as the Giants added a pair of runs in the bottom of the fifth. The Jays needed to get something going. In the eighth, the scales would start to tip in Toronto’s favour. After loading the bases, Russell Martin earned an opportunity to decrease the deficit the Jays faced. Martin hit a sacrifice fly to Hunter Pence in right field, managing to score Donaldson. 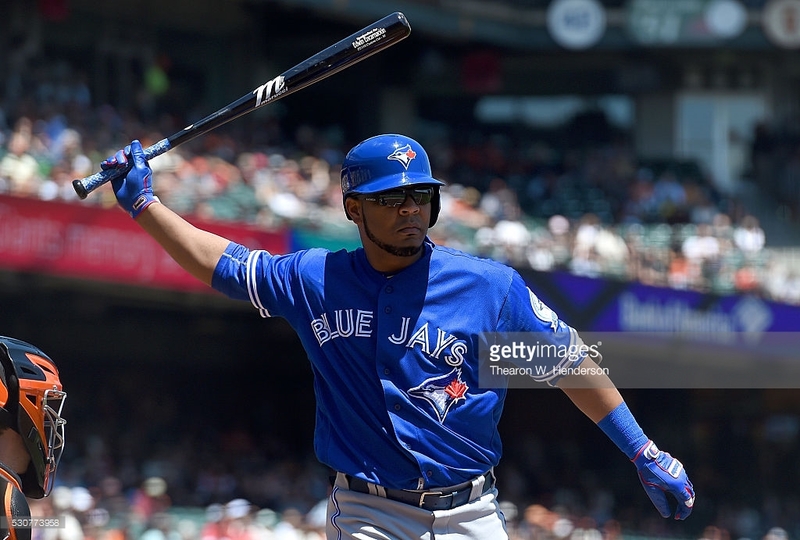 Encarnacion would move up to third. Justin Smoak would be sent in as a pinch hitter for Darwin Barney. The Giants would bring in Josh Osich to face Smoak, but would give up a single to right, scoring Encarnacion. Down by a run in the ninth, Santiago Casilla would come in to close out the game. His first batter he would face would be Michael Saunders. On a full count, Saunders homered to center field, tying up the game at four runs each. The Giants would see their three run lead fade away in front of them, ultimately sending this game into extra innings. This would be the fifth game in extras for the Giants and third for the Jays. In the 13th-inning, Ryan Tepera would be the sixth pitcher to come into the game from the bullpen. After a pitch hit Brandon Belt, Denard Span hit a sacrifice bunt plus a fielder’s choice moving Belt to second. Tepera would throw a wild pitch moving both runners up. The Jays would elect to intentionally walk Joe Panik loading the bases for Buster Posey. The Toronto Blue Jays (18-18) will now have a day off before heading to Arlington to face off against the Texas Rangers (20-15). The two clubs will see each other for a three game series starting Friday night. R.A. Dickey will start Friday night for the Jays as Martín Pérez will start for Texas. Both pitchers are in search of their second victories of the season. The Toronto Blue Jays would say goodbye to the Texas Rangers Thursday evening, hoping to send them off with a loss. After winning the previous two games with back-to-back walk-off wins, the Jays would look to keep rolling, with the hopes of having more of an offensive attack. After Prince Fielder would score Adrian Beltre to give the Rangers a 1-0 lead in the first inning, the Blue Jays would respond, and in a heavy way. With a pair of singles and a double from Edwin Encarnacion, the Toronto fans would see Toronto get five runs cross the plate. Kevin Pillar would see the plate twice in the first, as Derek Holland would face off against every batter in the line-up. 7-1 lead for the hometown club. After Jose Bautista would ground into a force-out, scoring Ezequiel Carrera, Encarnacion would be back up to the plate. He would decide to take his parrot for a run, homering a three run shot to left field, making it an 11-1 lead. 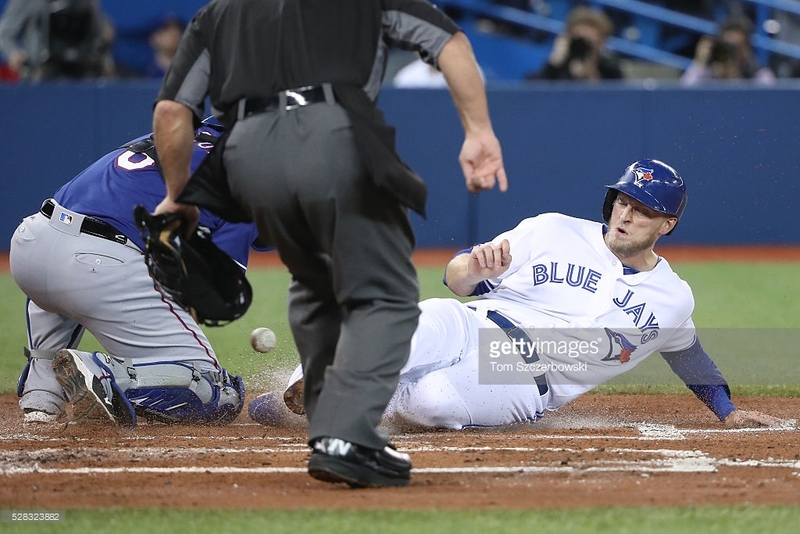 Things would remain quiet until the Jays added an extra one in the eighth, as Justin Smoak would hit in Josh Donaldson. Ryan Tepera would come in to pitch to close out the game in the ninth, The Rangers would get a run in, scoring Mitch Moreland, but would not be able to power through. The Jays would send the Rangers out of Toronto, winning the series on a much-needed offensive night. J.A. Happ would pick up his fourth win of the season. Holland would lose his second game of the season. Friday evening, the Blue Jays will welcome in the L.A. Dodgers in a three game set. Marcus Stroman will be sent to the hill, as he will search for his fifth win to keep his undefeated season going. The Dodgers will send Kenta Maeda as the counter in search of stopping the Jays winning streak. First pitch takes place at 7:07PM EST. On Monday evening, the Toronto Blue Jays would welcome in the Chicago White Sox and three former Jays in Brett Lawrie, Dioner Navarro, as well as Melky Cabrera. On the bump, would be Marcus Stroman for the Blue Jays as Chicago would send Miguel Gonzalez. Things would get started early, as both the White Sox and Blue Jays would score runs respectively, landing the Toronto club on top, 2-1. In the third inning, after getting two runners on base, Michael Saunders would homer on an 0-1 count to center field. Stroman would pitch through 6.2 innings of before being pulled in the seventh, leaving the bases loaded in relief for Brett Cecil. Coming out of the bullpen, Cecil would be unable to contain the White Sox, letting five runs cross the plate, with three runs being charged to Stroman. Chicago would add one more in the top of the ninth, securing their game one victory. Wednesday night, the Toronto club would be looking to rebound from Tuesday night, as knuckleballer R.A. Dickey would be sent out to search for his second victory of the season. He would be put up against Chris Sale. Things would stay quiet until the fifth inning, minus the one run scored in the top of the third on behalf of Avisail Garcia as he homered into center field, giving his team an early 1-0 lead. Chicago would get three runners home safely in the fifth and seventh inning. Former Blue Jays catcher Navarro would homer giving his club a seven run lead. The Jays would only manage to get one run in over four hits in the game, while the Sox would add three more runs in the top of the ninth, securing their second victory in a row, with the chance of sweeping the Blue Jays for the first time since 2001. Marco Estrada would look to look for his second victory of the season with hopes of helping to prevent a sweep at the Rogers Centre. Jose Quintana would be the counterpart in the attempt to sweep the Jays. It would be a very quiet game through the first six innings. It would turn worse for Estrada in the seventh. As he would ultimately reach 118 pitches through 6.2 innings, Marco would let three runs score before Ryan Tepera would come in during the eighth and let a fourth run cross the plate. 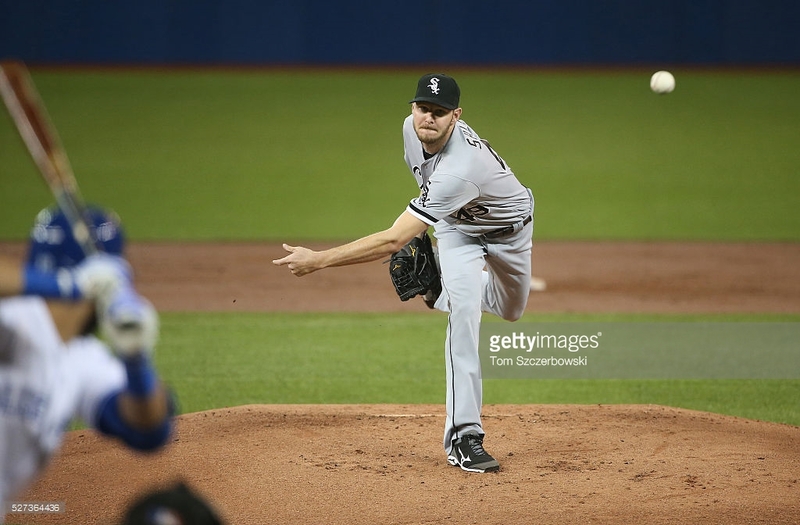 Quintana would pitch just six innings, but give up no runs over four hits, striking out ten. 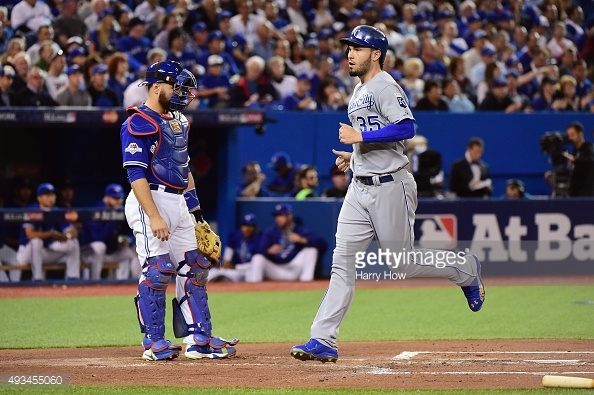 The Jays would find themselves swept at home for the first time since September of 2001. After a day off, Toronto will fly to Tampa for a mini three game series this weekend. Aaron Sanchez, J.A. Happ, and Marcus Stroman will be the three starters to go in Tropicana as the Rays will send Drew Smyly, Chris Archer, and Jake Odorizzi as the respective counterparts. Things got off to a rough start for the Toronto Blue Jays who were trying to tie up the series with the Kansas City Royals Tuesday afternoon at the Rogers Centre. The Jays would have the knuckleballer R.A. Dickey take the mound. Chris Young would be his counter part in today’s contest. The game would start off with a leadoff bunt from Alcides Escobar. Escobar would be the first player to leadoff the first inning with a hit in four straight games of a series. Ben Zobrist would then step to the plate, and on a 0-1 count Zobrist would launch a shot to right field scoring both himself and Escobar making it a 2-0 game. That would open the floodgates for the Royals, as they would score two more runs before the half inning would conclude. After giving up a home run to former Jay Alex Rios, Gibbons would come to the mound and send Dickey to the bench. Dickey would only go 1.2IP giving up 4ER off 4 hits. It would be the shortest outing in post-season history. In his last eight starts, Dickey posted a 1.94 ERA striking out 35 batters with a WHIP of only 0.84. In today’s matchup, the numbers would be quite different, as he would leave with a 21.60 ERA striking out only one and holding a WHIP of 3.61. Liam Hendricks would enter the game. In the bottom of the third, Donaldson would hit a ground-rule double, scoring Ryan Goins cutting the Royals lead to four. Jose Bautista would then ground out, but score Ben Revere, as they would only trail by three, winding right back up into the matchup. In the seventh, LaTroy Hawkins would come in, in hopes of ending the flood that was taking place. That would not be the case though as Hawkins night would be over at the start of it, as Hawkins would load the bases before being pulled in relief of Ryan Tepera. With the bases loaded, Tepera would see four additional runs score, now making this a 9-2 game. Trying to save their bullpen for what could be the last game of the 2015 season for the Toronto ball club, Gibbons would go to position player Cliff Pennington in the ninth to pitch. On his first throw in his career, he would throw a 91 MPH fastball for a strike. By the end, two runs would score and the game would end, as the Royals would dominate a night of quiet bats, taking the game 14-2. The wait is over. After 22 long years, the Toronto Blue Jays will be playing some October baseball. The Jays end the longest drought in North American sports and every single Canadian is behind them. It was quite an exciting Saturday afternoon at the Rogers Centre, as the Blue Jays would face off against the Tampa Bay Rays in game two of their final regular season series at home. David Price would take the hill, as he would be countered by the Ray’s ace, Chris Archer. Price would get things started quickly defensively shutting down the first three batters on eleven pitchers. Archer would then hope to do the same but things didn’t go as planned. The Jays offense would make sure to get on top quick. They would end the first inning after scoring five runs thanks to home runs from Bautista and Russell Martin. Head to the third, and that’s where Price would find himself in some trouble as the rays managed to climb back into the game with four runs of their own. Throughout the entire game, it went back and fourth on the scoreboard as both teams had their bats going. Heading into the top of the ninth, Ryan Tepera would be sent in to close the game as the Jays held a 10-5 lead. However, the Rays were able to get some hits off the right-hander and send him to the bench. Cecil would follow but do the same shortly after. Roberto Osuna, the 20 year old that has been hands down the Jays closer this season would come in and end it off. The Jays took game three with a final of 10-8. 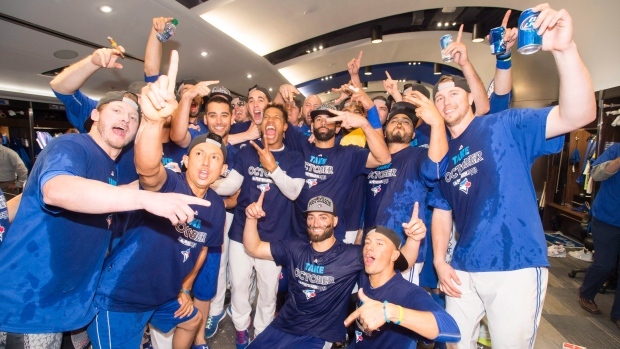 After the game, it was certainly party time in the clubhouse as the boys would cheers to not only another victory, but a note to the fact that they are heading to the postseason. It may just be a wild card spot at least for now, but depending on how the rest of the season goes, there could be another reason to celebrate if they clinch the AL East. The team currently stands four games ahead of their rivals, the New York Yankees for top spot with the magic number standing currently at five.